While we’re usually averse to frozen cocktails — mostly because of their sugary, hangover-y ingredients — there’s one we think belongs in your summer rotation. 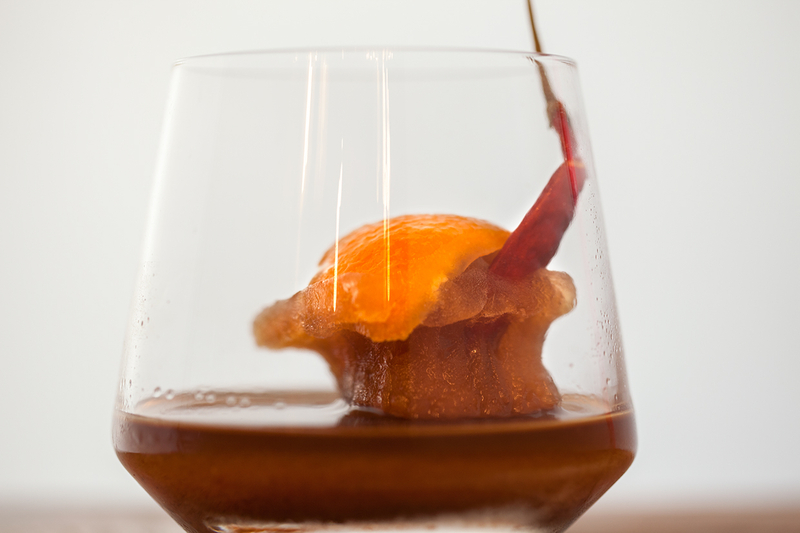 The Old Fashioned Cube at Xixa in Brooklyn takes every non-booze ingredient in a spicy, citrusy cocktail, and freezes it in a big ice cube. When you drop the cube into a couple ounces of alcohol — the team at Xixa recommends tequila or mezcal, since the flavors here go best with agave spirits — and give the cube a little time to melt, the drink changes with every passing minute, until you have a progressively more-interesting drink. It’s a crowd-pleaser — and what’s more, having a tray of these in your freezer will make you look like you actually know something about cocktails at your next party. Peel citrus fruits first and then juice. Keep 600g of juice, save the rest. Place 1 quart of water with all other ingredients together (including citrus peels and juice) in a saucepan and bring to a boil. Add 2.5 quarts of water. Pass through chinois (or another fine strainer), keeping only the liquid. Place arbol chili and orange peel in cube tray. Pour 7/8 of mixture in tray (almost to the top). Serving: Place in an old-fashioned glass, pour 2oz of your spirit into the glass, and serve.